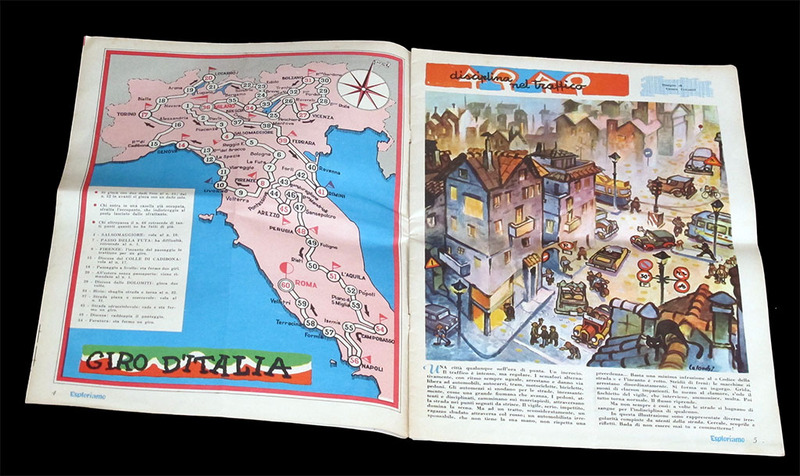 Giro d'Italia game featured in the february 15th, 1959 edition of the children's magazine Esploriamo. Years ago I only had a copy of the game without the rest of the magazine (see below). It was pasted onto cardboard, so I could not even see the opposite page. 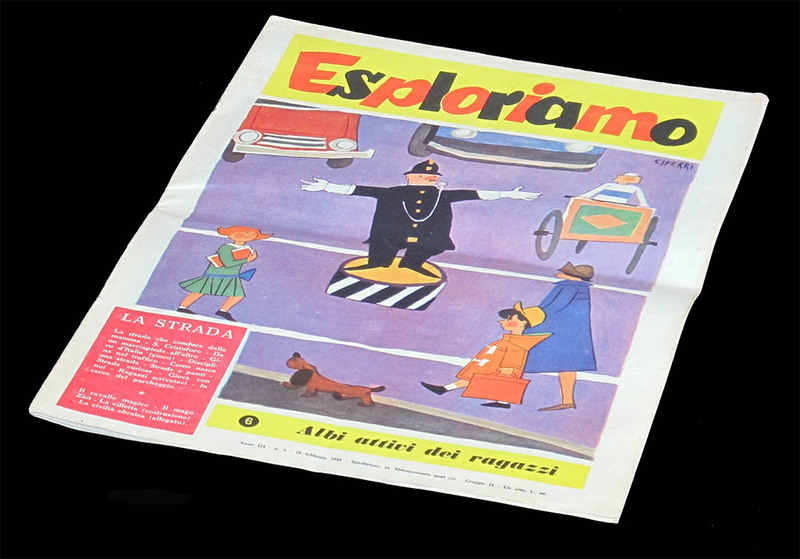 Of course I could read "Esploriamo" and the page number ("4"), but it has taken me a few years to find the magazine. Here it is at last. 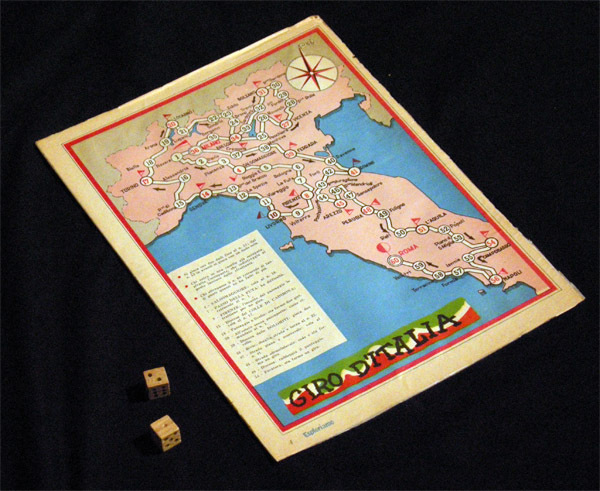 When I did not know the origin of this game I wrote, confidently: "[this game] is easy to date, since it follows the stages of the 1950 edition of the Giro". Well, surprise! 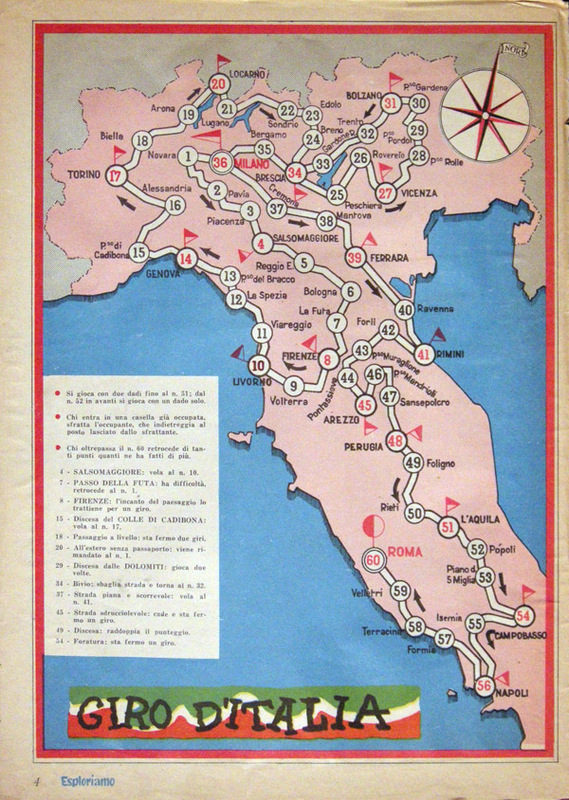 Although it is true that the game follows the stages of the Giro d'Italia of 1950, this only proves that the game was made later than that. Of course a nine year delay is very unusual. Maybe the game was meant to be published some time before, or maybe it actually was, and this is is a reprint of a previous game, who knows. As you can see, there isn't any cyclist reference on the board. 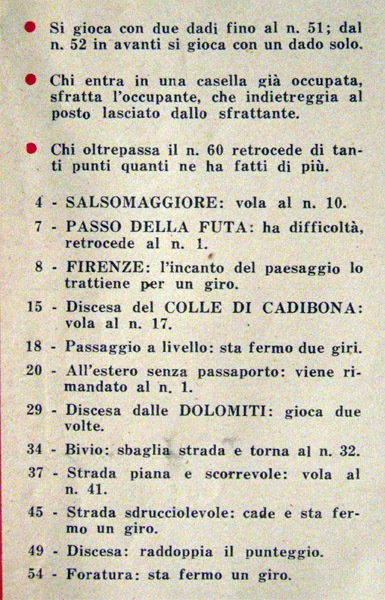 One could even think that it is a gamne about the homonimous car race, thoug of course the coincidence with the cycling 1950 giro rules this possibility out. In the rules we finally find some cycling references: climbs, descents, punctures, falls... Yes, cars may puncture (dont they?) but they do not fall. I received the wooden dice on the picture above with my first copy of the game, but I would bet they are not original. I do not imagine the dice being given with magazine. Strangely, these dice look like the one I do NOT have for this other Giro d'Italia game.